The measure of the artist is to have the eye to see the spirit underlying the particulars, and the skill to capture both in paint. The relation between spirituality, creativity and expression of art is undeniable. They are so intermingled that in many ancient societies with conscious regard for sacredness, there were no separate name for artist or art. Everyone was artist and every action was an action of sacred creativity. Japanese tea ceremony is a reminder of such action with mindfulness, travel to far off land with sacred awareness what we named over time as pilgrimage. And it should not be surprising as John O’Donohue reminds us, "The heart of human identity is the capacity and desire for birthing. To be is to become creative and bring forth the beautiful." In one sense, spirituality is the sacred ground to be aware of the relationship to mystery. Human quest for meaning leads to a longing for something that is beyond the limits of our capacity to fully describe in language. We come to recognize there is a depth dimension to the world beyond surface appearances. This is the presence that great mystics have described as the God beyond all names, the Divine or simply the Presence. Spirituality facilitates an encounter with the presence of mystery in our lives and nurtures a relationship with it. Creativity is a powerful shaping force in human life. It is an intangible human capacity of a transcendent nature – it moves us beyond ourselves in a similar way to spirituality. The psychologist Rollo May describes creativity as "the process of bringing something new into being," something that did not exist before – an idea, a new arrangement, a painting, a story. Ellen Dissanayake, an anthropologist, suggests that the act of creating is actually a biological need that is basic to human nature and she describes creating as “making special.” Creativity includes the arts, but really encompasses the whole of our lives. Every act in which we "make special" can be a creative one. Carl Jung believed images are expressions of deep human experience and our authentic selves. They are the natural and primary language for the psyche and only secondarily do we move to conceptual thought. About the intelligence of creative expression gifted to human being, sufi poet and mystic Rumi tells us: "One already completed and preserved inside you: a spring overflowing its springbox. This intelligence is a fountainhead from within you, moving out." Creativity and Art is about honoring and moving with this intelligence that originates from within us, inside. Renée Tay is an extra-ordinarily talented artist from Southern California, to whom the inner visions are a gift from Invisible and from that mystery dawns the inspirations of her creative expression, her paintings. She is a painter of Mystical Pointillist-Visionary and Fantastic Realism. Only at the age of 17, her painting was to be found in the San Diego Museum of Art. Her father worked for Scripps Institute of Oceanography and ocean has always been an important part of her being. 9th generation grand-daughter of Mayflower's Miles Standish, Renée grew up like a mermaid in the Pacific Ocean eating abalone and lobster and many of her painting is clear reminiscence of her fantasy and creative imagination about fairy or mermaid like mysterious luminous feminine beings. Sometime they appear in Renée's canvas as Sea Princess, sometime as Butterfly Fairy Princess or Little Wood Fairy. Renée Tay's stylistic use of vibrant spots and dots, mixed with her deep tap roots in folk art traditions, influenced primarily by the folk arts of Russia, Europe and Mexico. She is also impassioned by the intricacy of Persian and East Indian miniatures. Deliberately abandoning structured rules, her paintings speak most wittily from a surprising place - the invisible. This hidden energy burst forth in every painting of her. Born in California in 1960 and trained both as a fine and commercial artist, Renée entertained various careers such as dresser-wardrobe for the opera and traveling Broadway show, art studio manager, worked for Disney, Manager-Buyer in the Symphony, farm store, fish hatchery and costumed for Mattel. In California, she has been exhibited in San Diego, Laguna and Newport Beach. Also in Las Vegas, Nevada and Santa Fe, New Mexico. A seeker in the path of Sufi Movement, founded by Hazrat Inayat Khan, Renée Tay currently lives in a remote retreat mountain in California. 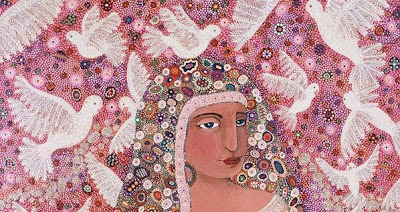 "The INVISIBLE reveals itself in my Mystical Pointillist paintings. Thousands upon thousands of colorful hues of energy swirl and dance in the form of dots. Layers upon layers of dots separated out by the viewer's own mind to appear as if the painting travels into and out of it's own framed boundaries. 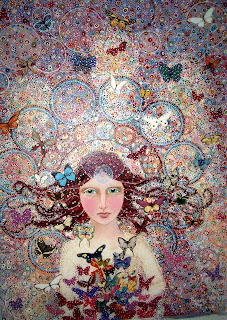 Goddesses, princesses and even my own higher self with their sweet innocent expressions stand out by their simplicity in the obsessively detailed explosion of dots. Butterflies represent the gentle caresses of the INVISIBLE. They are there to remind us that we too are beings emerging from our own chrysalis. Being a pointillist painter was in itself, a metamorphous. It first started from a vision I had of art from my life before this life. I saw an image that I can only compare to an massive exploded stain glass window. I began painting these images in my folk art paintings in the 1990's. Later to be fine tuned to almost complete pointillism. In contrasted to my "Must cover all space" style of art, my life is a simple existence. I am very happily married to a fellow artist. We live a simple life with few belongings in a humble home in the mountains of Southern California. I am an Empath Intuitive and I feel the World as energy all around me. So I prefer my neighbors to be ancient oaks, moss covered boulders and fresh breezes." Pointillism is an unique style of painting, a form of post-impressionism in the history of art in which small distinct points of primary colors create the impression of a wide selection of secondary and intermediate colors. Aside from color "mixing" phenomena, there is the simpler graphic phenomena of depicted imagery emerging from disparate points. The term "Pointillism" was first used with respect to the work of Georges Seurat. This post-impressionist technique relies on the perceptive ability of the eye and mind of the viewer to mix the color spots into a fuller range of tones. When observed closely the individual dots of colors make themselves distinct, but when seen in full, the whole canvas of art give rise to a fuller picture and expression. In a sense the style of pointillism carries mystical way of witnessing. Just like when observed too closely each dots and colors are all what one sees, similar is life and the realization of mystical truth. When we are too caught up with the apparent and ever shifting moments which are like dots, we often miss the whole picture and the complete meaning remains illusive. When we step back, look out from the window of realization and are ready to observe with a wider perception, only and only then the whole image manifest itself with full spectrum of meanings. In a pointillist painting each dots of color has its role and importance, yet when seen with complete oneness, collectively they convey the wholeness of artists' imagination. Such is also true in the mystical realization of our existence. When seen in full, every bits and pieces having its individual meaning give rise to a fuller picture, the completeness of the wondrous phenomena we call life. It's not about what it is made of nor how it is made, it's about inspiration of function that renders the soul which makes craft, "Art." Craft is based on functionality and spirituality is the basis of art. I am endlessly full of creative ideas. Sometimes I start on a piece and it changes as it tells me what it wants to become.